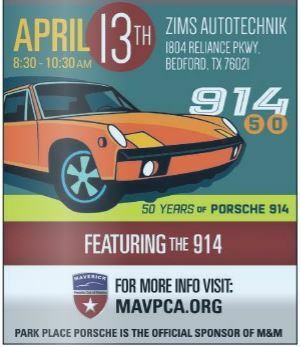 DFW Area Teeners, Join us for Mavs and Mochas, Celebrating the 914's 50th anniversary. Betty and I will be there. Hope to see all of you at Zims. I am going try to make this Clay! I’ll be there, Clay. I’ve had it on the calendar since Aaron at Zims told me about it several months ago. Unfortunately, I won't be there. I am at Road Atlanta that weekend for a PCA Club Race. When did the Road Atlanta thing come up??? Because I’ve known about this event since maybe November. I think you just can’t decide which 914 to bring to the event. I can help with that. Just leave the keys with me and I’ll drive the six up there! Dang Rob - you know all the cool stuff. We didn't realize this one was celebrating the 914 specifically until a few weeks ago and Clay had committed to the Road Atlanta thing months ago. And you can't drive the six. The carbs are off the motor being rebuilt. And the 4.0L isn’t done yet, either! I guess I’ll have to drive mine. On the plus side I did give it a nice wash and general clean up yesterday. I do have to ask though. If the 4.0L isn’t done and the six is having the engine rebuilt, what exactly are you doing at Road Atlanta? The engine in the six is fine. The carbs are being rebuilt. I am going to Road Atlanta as part of the PCA National Timing and Scoring team. I get to spend 3 days staring at a computer that is timing race cars, instead of staring at a computer to fix servers. 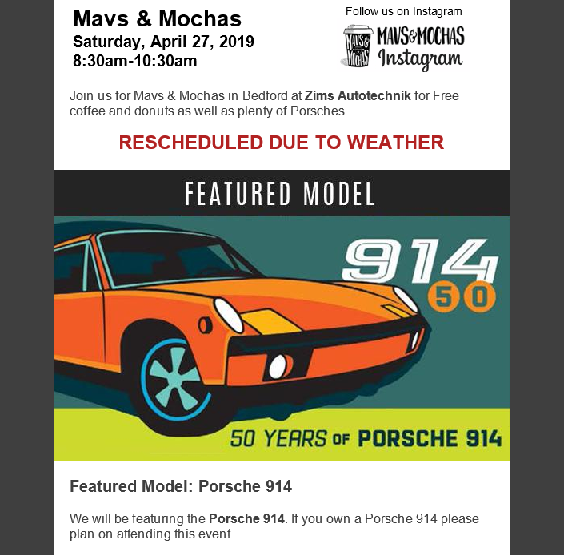 FYI - Mavs and Mochas originally on Saturday 04/13/2019 has been rescheduled to Saturday 04/27/2019 due to weather!